Have you ever felt totally stuck? Do your ever feel like your relationships, career or life goals seem to be spinning in place? Do you wonder why some changes stick, while others are doomed to failure? In today's special musical episode of "Why It Works," Jeff Ikler, Director of Quetico Career and Leadership Coaching, reveals some of the hidden mechanisms behind why Change works. We explore why a canoe is better than a rowboat, identify the mortal enemy of your Inner Critic, and reveal Jeff's surprisingly simple approach to helping his clients get unstuck. Jeff Ikler is the Director of Quetico Career and Leadership Coaching. There he helps individuals make desired career and life shifts and leaders develop sustained changes in their leadership practices and in the organizations they lead. His approach blends data-driven coaching, and consulting informed by working for more than 35 years in the corporate world. Jeff cohosts the podcast "Getting Unstuck," which helps individuals and organizations to think differently about change – not as something to fear; not as something they constantly have to react to, but as something they can initiate for their own productive purposes. In addition to their podcast, Jeff and his cohost are in the process of writing a book about change, Shifting: A Practical Guide for Leaders and Teams on How to Create a Culture of Productive Change. Jeff lives in New York City via long stints in Boston and Chicago. He loves the vibrancy of the city, but encourages all drivers to go through a 12-step program to reduce their need to lay on their horns. When he's not coaching, podcasting or writing, you can find him cooking or on a stream waving a fly rod at trout. Thanks to Daniel Joe for sponsoring this episode! 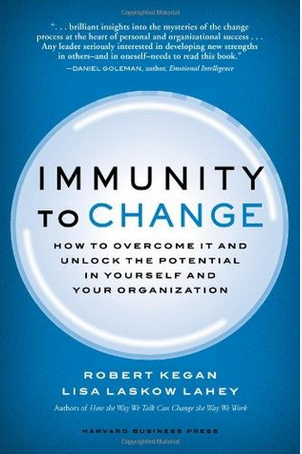 Immunity to Change: How to Overcome It and Unlock Potential in Yourself and Your Organization, by Robert Kegan and Lisa Laskow Lahey. Paper, Joe, I need pages and I'm willing to pay for them! No problem, buy the book here.